Show caves belong among the real underground gems of Slovakia. Several of them are known throughout the Europe and even the world. They are luring invitation to interesting journeys for beauty and knowledge. There are more than 4450 caves known in Slovakia by now, twelve of which are open for the public - The Belianska Cave, The Bystrianska Cave, The Demanovska Cave Of Liberty, The Demanovska Ice Cave, The Dobsinska Ice Cave, The Cave Domica, The Cave Driny, The Gombasecka Cave, The Harmanecka Cave, The Jasovska Cave, The Ochtinska Aragonite Cave and The Vazecka Cave. With us you will have the privilege to visit one additional cave: The Cave Of The Dead Bats (optional). 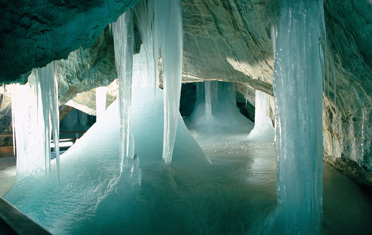 The Ochtinska Aragonite Cave, The Cave Domica, The Gombasecka Cave and The Jasovska Cave were inscribed on the World Heritage List in 1995 and The Dobsinska Ice Cave in 2000. Slovakia is unusual in that it can boast of three different kinds of cave-stalagmites, icicles and aragonite. What makes that aragonite cave so unique is that it is one of only three in the world. Every year new cave spaces are discovered in Slovakia, mostly thanks to voluntary cavers associated in the Slovak Speleological Society.